Robust Pecorino and Fontina are the starring artisanal Italian cheeses that abound in this rustic Italian gift. Paired alongside rich sopressata, dry-cured Genoa and many more delights, this rich Italian menu will transport anyone to the rolling hills of Tuscany, the sunny island of Sardinia, or the snowy peaks of the Italian Alps. Fontina, Pecorino Marzolino and Toscano. Your gift will leave a lasting impression as they open this presentation-ready, exclusive GiftTree gift crate. if ordered by 4:00 pm EDT Friday April 26th. Italian Cheese and Charcuterie is a hand delivered gift. These gifts are delivered by one of our local design centers located throughout the United States and Canada. Same day delivery is available for most gifts when ordered before the cutoff time. The cutoff time for Italian Cheese and Charcuterie is 1 PM in the recipient's time zone. Pecorino MarzolinoA young pecorino rubbed with extra virgin olive oil and tomato paste and aged anywhere from 10 to 30 days. It is hand molded into its distinct river stone shape for a unique looking piece of cheese. The flavor is mild with a slight acidity. Fontina Val d'AostaThe classic Italian cheese, made from unpasteurised milk of the Valdaostan Red Spotted cows grazing on the plains of Aosta Valley. The texture of Fontina is creamy and dense, while the flavor is nutty and mildly sweet. Pecorino ToscanoPecorino Toscano is a sheep's milk cheese made in Tuscany. Milder than other Pecorinos, this cheese contains higher levels of butterfat and should be eaten at room temperature. When your Pecorino comes to room temperature, don't be surprised if you see beads of oil on the cheese. 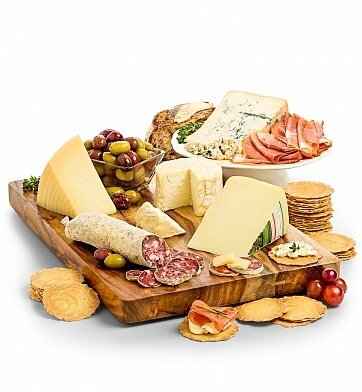 Italian heritage meats and robust artisanal cheeses. Arrives presentation-ready in our signature gift crate. Includes a complimentary card with your personal gift message.